NTA JEE Main 2019 Application Form – NTA has opened Category correction window for all candidates from 15th April 2019 until 17th April 2019. Candidates who have filled the application form can change their category using the link available below. If there is any discrepancy then applicants have to make use of this facility to rectify the mistakes made during the registration process. The exam is conducted in two Papers: Papers I for candidates interested in B. Tech and B.E and Paper 2 for candidates interested in B. Plan. NTA JEE Main 2019 will now be conducted in only the computer-based mode. Candidates must have completed the application process successfully in order to take the NTA JEE Main 2019 Exam. Candidates can Make Changes in Category from 15th April 2019 to 17th April 2019 by using Application Number and Password. Click Here to View the JEE Main April 2019 Information brochure. JEE Main 2019 Dates for Jan & April exams have been announced. The JEE April 2019 Application Form has been released on 8th February 2019. Check here for exam dates. The NTA JEE Main 2019 Application Form was available on the official website i.e. nta.ac.in on 8th February 2019. The registration procedure continued till 7th of March 2019. Candidates must first register with a valid email Id and other details. Candidate must note that only one application was entertained per candidate. Candidate must have also paid the application fee depending on the paper for which he/she desires to appear and the category that/she belongs to. Applicants should have paid attention while filling the application form but if any mistake was committeed by them then they make the use of correction facility. The application form correction facility has been released by the conducting authority and it will last till 15th March 2019. Did you know that in the JEE Main 1st attempt, there were 11,09,250 registered candidates (9,29,198 for Paper-I & 1,80,052 for Paper II). 21791 candidates are registered for the examination at 17 centers in 15 cities in the North Eastern States. 7551 Candidates at 09 centers in 04 cities in Jammu & Kashmir. These numbers are going to change for JEE Main 2nd attempt! NTA has announced that all the candidates have to take the exam in computer-based mode. Know how to take the JEE Main 2019 computer-based exam here. JEE Main 2019 Application Form: As National Testing Agency is conducting the JEE Exam. 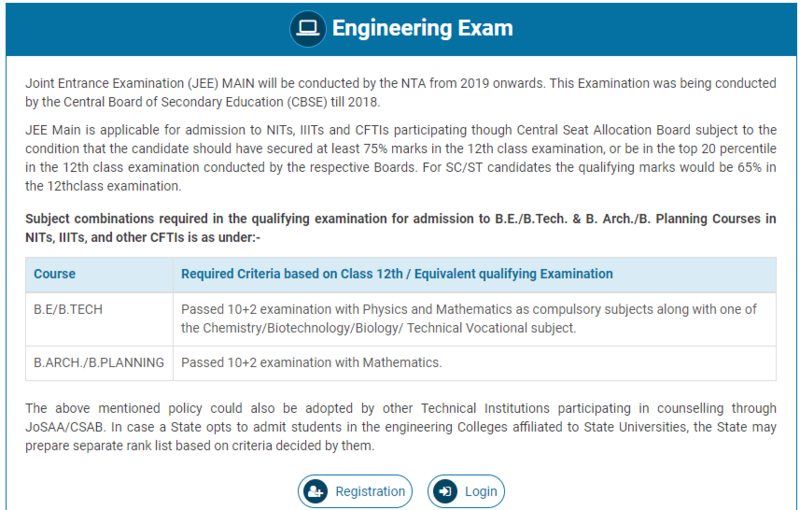 The JEE Main 2019 Application Form has been made available on the NTA Official Website (nta.ac.in). Registration steps like filling the form, uploading documents, submitting the application fee, etc. have not changed. Step 1: Candidates had to visit the website of NTA, nta.ac.in. Step 2: Candidates had to click on NTA exams or on Joint Entrance Examination under the Engineering Section as given on the same page. 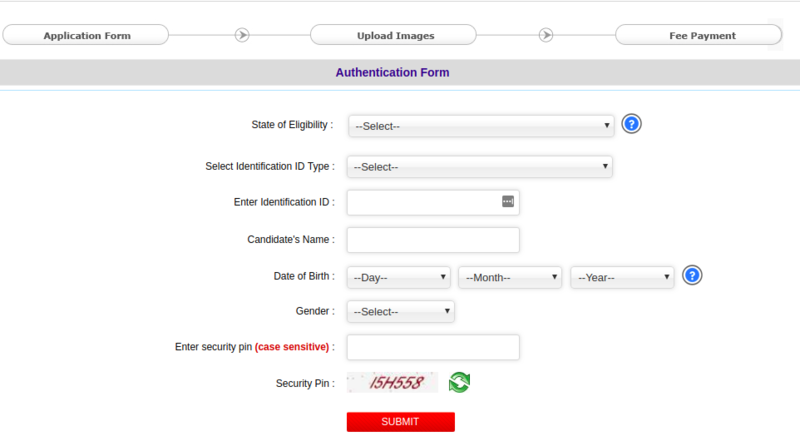 Step 3: After clicking, candidates must have observed the registration button as shown in the image below and they should have read the Eligibility Criteria before clicking on the “Registration”. Step 4: Candidates were then redirected to the JEE Main 2019 official website where they have to click on “Fill Application Form”. Step 5: In order to apply applicants had to click on the “Apply for JEE Main 2019”. Candidates also had to read all the prescribed instructions carefully and then they had to proceed to apply online by clicking on the button given at the end of the page. Step 7: Candidates now had to Upload the scanned images in the prescribed specification given on the instructions page. Step 8: After the candidate had filled the application form completely, he/she must have paid the Application fee. Candidates had to also take a printout of their submitted application forms. 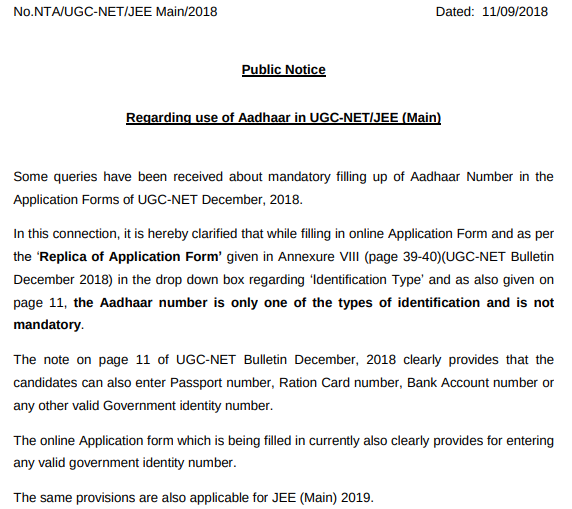 Is Aadhar Card Required for JEE Main 2019 Registration? For the last two years, Aadhar card was made a mandatory possession for each candidate to fill the application form filling of JEE Main. However, since JEE Main 2019 is now to be conducted by NTA, they have asked the candidates to enter their Aadhar card number. However, candidates must know that it is not compulsory for candidates to enter their Aadhar card number during JEE Main 2019 application form filling. JEE Main 2019 Form Fee: Candidates were able to pay JEE Main Application form Fee 2019 via any of the two modes which were online or offline mode. Well, guess what! NTA released the JEE Main 2019 Application Form Fee. Check the table below for JEE Main Registration fee. Before filling NTA JEE Main 2019 Application Form, candidates should ensure their eligibility. The candidates who have passed XII examination in 2017, 2018 or appearing in 2019 irrespective of their age can appear in JEE (Main) examination – 2019. Qualifying Exam: Passed 12th or its equivalent examination in 2017 or 2018. Subjects: Candidates must have taken at least five subjects in class 12th/qualifying examination in order to be eligible for writing JEE (Main)-2019. The candidates who have taken four subjects are not permitted to write JEE (Main)- 2019 and if such candidates appear in JEE (Main)-2019 by furnishing wrong information, their rank/result will not be declared. The number of attempts for the JEE Main 2019 exam is 4 times. There were some documents that applicants need to upload in JEE Main 2019 form, and other documents that they need to refer to while filling up the application form. Passport size photograph – The photograph should be colored or black/white (but clear contrast) with name of the candidate and date of taking the photograph printed on it as shown below. It should be without cap or goggles. Spectacles are allowed. Polaroid photos are not acceptable. Applicants must make sure to upload the images in the specifications given below. Any image uploaded in incorrect size or format will be liable for rejection. Aadhaar card/ ration card/ Passport/ Driving License/ Voter Id/ Etc. Other than these, candidates might have required certificates like caste certificate, if applicable. All the things applicants have filled in their respective JEE Main 2019 Application Form must be correct and verifiable. If candidates committeed any mistake while registering then they can make modifications now in order to apply for JEE Main 2019 April session examination. Correction in JEE Main 2019 Application Form: The National testing Agency have provided the facility of application form correction from 11th – 15th March 2019. Applicants who have filled the application from and submitted it before the given deadline can only make use of this facility. However, the correction will be limited to particular sections only. Check details about the same in JEE Main 2019 application form correction. 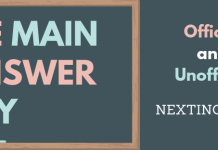 Preparing for JEE Main 2019? Want easiest and practical ways to study for JEE Main exam without confusion? We have penned down the best way to boost your preparation with official exam pattern, syllabus and preparation books here. Question: Can I appear in both the exams i.e Jan and April? Answer: Yes, you can appear in both the exams. 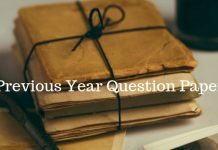 Question: How many times can I appear in Phase-I or Phase-II JEE Exam? Answer: You can appear one time in each exam. Question: What is the benefit of appearing twice for the single exam. Answer: The maximum marks obtained in the exam (Phase-I or Phase-II) will be considered for JEE Advanced. Question: Who will conduct JEE Advanced? Answer: IIT has authority to conduct JEE Advanced based on the NTA JEE Main Phase-I and Phase-II Examination. Next articleAIIMS Nursing Admit Card 2019- Download Admit Card Now! Hi, we cannot give any exam centre details as the exam centres will be allotted on a random basis by computer software. Please, can you give me brife instruciton how to get the form for the fill up. Hi, CLICK HERE to know exactly how to fill the JEE Main form. में ये जानना चाहता हु की जैसे में मध्य्प्रदेश का हु तो मेने फॉर्म में चार सेंटर दिए है और मध्यप्रदेश के बाहर के भी सेंटर फिलअप किये है तो बाहर के भी आ सकते है क्या??? Hanji, Agar apne bahar ke centre fill-up kiye hain to unmein se bhi apko kiye jaa sktey hain. First, log out from all the devices from where you had tried to log in for JEE Main application form. Log in again and try resetting your password. If the error still persists, do let us know. NTA will use the normalization procedure to calculate the final rank. Read the full procedure here. My date of birth in birth certificate is 22nd feb 2002 but it is misprinted in my aadhar card it is 22nd feb 2001 . Will i be able to fill the form?Will there be any issue later.? Hi, please note that the Aadhar card is not necessary for JEE Main Application form filling. Since there is a misprint on your Aadhar card, it is better suggested to not use the Aadhar as your Id proof. Ap JEE Main and NEET 12th appearing mein de sakte ho aur yeh better hoga ki ap iss saal apply karo taki apko agle saal dobara exam dene se pehle ek idea hoga ki paper kaise ata hai JEE Main and NEET ka. How many exam centre in Rajasthan.Please tell me. You can check the list of exam centers in this article. I am currently studying A levels in Bangalore and have taken up Physics ,Chemistry and Maths as my A level subjects and I have done AS level English language in the previous year. Will I be eligible to write JEE Mains and Advanced? Haan ap JEE Main 2019 De saktey ho. Both January and April session will be counted as total 1 attempt. Yes, you can use it to fill in your category during application form procedure. IIITs mein apply JEE Main k through kar saktey ho jiske liye koi age limit nahi h.
JEE Main qualify karke JEE Advanced 2019 (admission to IITs only) ka exam dena hai toh Candidates should have been born on or after October 1,1993. Five years relaxation is given to SC, ST and PwD candidates, i.e., these candidates should have been born on or after October 1, 1988. The identification Id is any government approved ID like passport, Aadhar Card, Voter Id, Driving License, etc. MY HOME TOWN IS KARNATAKA, AND IAM POSTED IN TELENGANA AS IAM WORKNG IN PUBLIC SECTOR UNDER THE MINISTRY OF DEFENCE, MY DAUGHER IS STUDYING IN TELENGANA SINCE BEGINING I HAVE AN OBC CERTIFICATE ISSUED FROM KARNATAKA STATE . BUT THE CASTE DOES NOT EXIST IN TELENGANA. 1) CAN I CLAIM THE QUOTA IN TELENGAN WITH THE CERTIFICATE ISSUED IN KARNATAKA . 2) CAN I CLAIM HOME STATE QUOTA IN KARNATAKA STATE AS WELL AS IN TELENGANA. KINDLY SUGGEST ME in this regard. 1) No, you cannot claim the quota in Telangana with a certificate from Karnataka. 2) Candidates of JEE Main who have passed class XII from a particular state and have cleared the examination will come under home state quota. Therefore, you can claim the home state quota of Telangana only. what are the particular examination dates for JEE MAIN phase-I held in between 6th Jan to 20th Jan 2019? The dates have not been announced as of now, we will update it as soon as they are published officially. The particular exam dates have not been announced as of now, we will update it as soon as they are published officially. Sir maine 12th 2106 me pass out kiya tha ..
Phir 2017 me improvement diya tha ..
Kya mai jee main 2019 ke liye apply kar sakta hu?? Nahi, aap JEE Main ke liye apply nahi kar saktey. Hi Vivek JEE Main 2019 Application Form has been released Click Here to Apply Now. Ap IIT mein admission le sakte ho agar ap JEE Main and JEE Advanced qualify karte ho toh. (i) The use of Aadhaar for the candidates of JEE (Main)-2019 will result in accuracy of the candidates‟ details. hassle free manner. Aadhaar obviates the need for producing multiple documents to prove one‟s identity. to any law or any contract to this effect. in online application for JEE (Main)-2019 for the purpose of his/her identity and authentication thereof. Aadhaar enrolment centre (list available at http://www.uidai.gov.in) to get enrolled for Aadhaar. 3 Is Aadhar Card Required for JEE Main 2019 Registration?